Back at home I laid on the couch with one leg over a couch pillow while Daniel dozed on a yoga mat on the floor next to me, holding my hand through contractions. The contractions were becoming unbearable and I started to feel overheated during them and then shaking afterwards. I started vomiting from the pain. I was obviously in transition. But because I was in transition, I was too out of it to realize that it was CLEARLY time to be at the hospital and that even though I had been at only 2cm dilated an hour ago, things had obviously progressed. “You’re not in labor, “ is what they’d told me at the hospital, though. And I did not want to go back there. Everything was getting foggy and confusing. I got on my hands and knees in the tub while he poured hot water over my lower back where the worst back labor pain was. I told Daniel I thought we should go. He asked if he had time to make a cup of coffee. “Sure” I said. “After all, maybe I’ll just show up again and they’ll say I’m 2cm and they’ll send me home again in misery.” I sat on the couch for a minute while his coffee brewed and he packed up the car. It was 4:30am. A little over 2 hours since being sent home. The contractions on the drive back were absolutely horrible. We parked the car. Daniel was offering to drop me off in front of labor and delivery but I needed to not be separated from him even if it was just for a couple of minutes so I preferred to walk with him across the parking lot. This was when things got real serious real fast. I could barely make it a few steps before having to stop and hold onto him through long contractions. He was very calm and didn’t panic but he realized that I was minutes away from delivering and started looking around for places to deliver the baby if he needed to. He wisely didn’t verbalize these thoughts because he didn’t want to alarm me and just got me inside as best he could. We went up the elevator called “The Baby Express” (which sounded absurdly chipper to me) that leads to the hallway outside of triage and L&D. I had a contraction while stepping out of the elevator. I started screaming. “SHE’S COMING OUT!” Daniel threw the birth ball he was holding into the waiting room and ran for help. I couldn’t move. I grabbed onto a water fountain for support whilst continuing to scream. In all my previous labors, I have been a silent birther. I don’t make noise during contractions. I just go into my own head and breathe the baby down while I pray through them. When pushing I SOMETIMES make a low moaning sound. I do not scream. So this was…ahem, RATHER A DIFFERENT EXPERIENCE. Apparently there were no wheelchairs to be easily found (we’re still confused about how that’s possible. Daniel pointed out that they’re not like grocery carts that need to be rounded up all over the parking lot…like surely you should be able to find a wheelchair on the L&D floor but ANYHOW) so they brought out a rolling office chair. They put me on the chair and raced me down the hall while Daniel and a nurse held my legs up and I screamed bloody murder. I’m sure it was a sight to be seen and it’s tragic that we don’t have a video. Having just been wheeled down the hall screaming in an office chair with a baby about to crown I was a bit confused about what other emergencies she had in mind. Within a minute the baby had crowned and in another minute she was born still inside the intact bag of waters! A nurse and Daniel caught her. I didn’t realize this at the time but Daniel said he could see her “en caul,” wiggling inside the bag of waters trying to cry and as soon as they opened it up I could hear her blessed little voice and they lifted her onto my chest. They wiped her off a little bit and I started nursing her skin to skin. I kept repeating, “I love you, Hildie!” to the baby and “I’m SO RELIEVED IT’S OVER!” to Daniel. So approximately 3 hours after being told I was not in labor, Hildegard Rose Stewart (I wrote about her naming a few months ago) was born at a dainty 6lbs 8oz, pink as her rosy name with a head of ginger brown hair and grey eyes that will turn brown like her brother and sisters’. And I think she’s pretty remarkable, considering her exciting entrance and the fact that only 1 in 80,000 babies are born en caul! I wish I had a photo of that since I missed seeing it and didn’t get a good look at her until they had opened up the bag of waters. She is the sweetest baby! She nursed like a champ from the very beginning and has been content from the start except when getting her diaper changed. A friend asked me how I’m doing emotionally after that labor. I do feel angry that my instincts were dismissed and that I was told not to listen to my body. I really don’t understand how you can watch a 4th time mother moan through contractions and send her home. 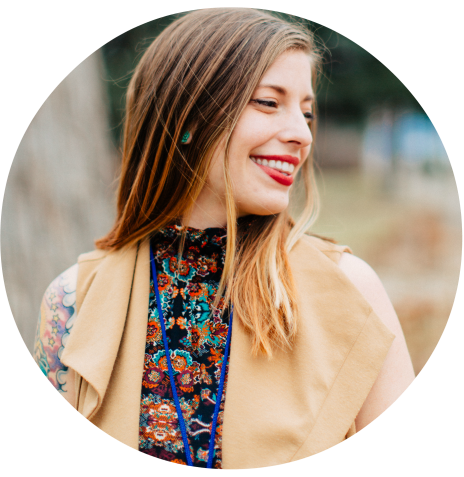 And the emotions I felt while laboring through transition at home lacking all confidence that I was even in labor were very hard. I don’t know when I’ve felt so confused and despairing. But her birth was very satisfying, despite being so crazy! I probably need to keep processing everything but emotionally I feel pretty good. It’s been my easiest recovery yet. My midwives really stayed on top of my anemia and I think that’s why I had less bleeding (first delivery that I didn’t need pitocin after delivery) and less lightheadedness than I usually do. 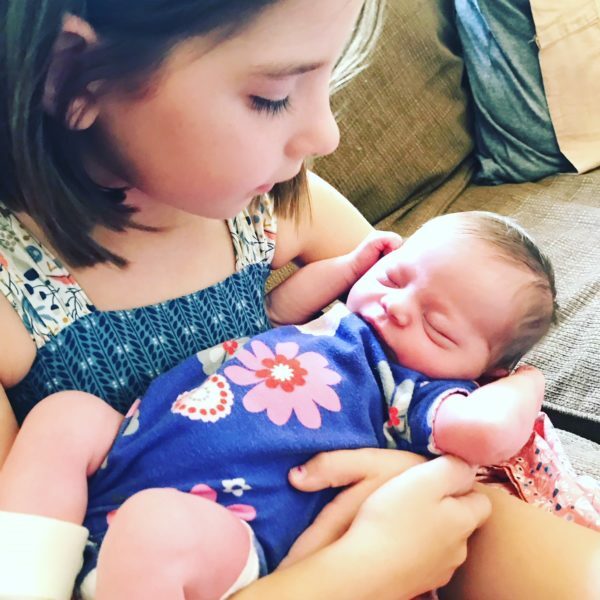 After Gwen’s birth my blood pressure dropped alarmingly and I felt weak and dreadful. But I really felt great as soon as the placenta was delivered (my midwife got there for that). My parents drove out from Florida and are watching the kids at a hotel while Daniel and Hildie and I recover and take a few days to settle in. What a gift! We feel like we’re on vacation, especially since my recovery has been so easy so far and baby is thriving. We are falling in love with Hildie Rose. The kids are smitten and Olaf, our goldendoodle, considers it his duty to guard her with constant vigilance. He seems quite concerned that we might not know what we’re doing and refuses to leave her side. It was a tough pregnancy for me in so many ways. It really challenged my pride in my own self-reliance during so many months of being too sick with HG to take care of myself. I had to face a lot of my need for control and difficulty trusting God. I was stretched and broken in ways I needed to be. Then the past month has been a whirlwind of anxiety over the breech/transverse situation, the ECV, and labor. But the past few days of knowing Hildie have more than made up for all of it. There is no joy like the joy of a new baby. I can’t believe that we get to keep her. That she’s ours to love for always. I am overwhelmed by gratitude and I appreciate all the prayers and encouragement that have supported us over the past 9 months. It’s always hard to imagine that your heart can expand and love multiply all over again with a new baby, but each time it happens. I can’t imagine life before Hildie anymore. I’m so glad I’m her mom. Congratulations, Stewart family! Yay for Hildie Rose! Haley, you now have another solid data point in the “mama knows best” category. Wow what a story! Congratulations! Oh my gosh, en caul?!?! I wish you had a picture too! That’s so cool! Oh gosh, your story brought back a lot of painful memories for me, something similar happened with my third with them not believing me that I was in transition and I ended up almost delivering him into the triage toilet. It was awful and I winced every time someone said “well that’s great story!” or “at least he’s here and healthy!” It’s so awful how vulnerable birthing women are in our hospitals. 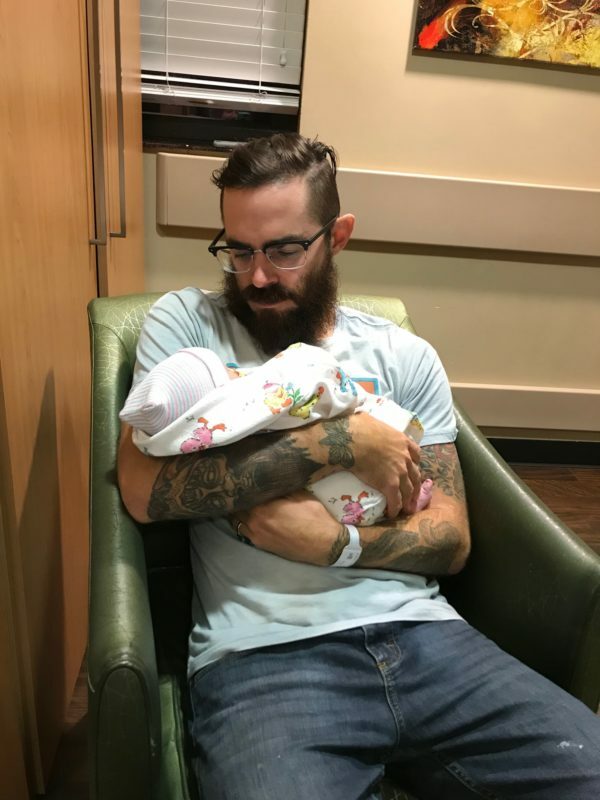 I had a home birth for my fourth. They should totally have listened to you!! When my mom was in labor with her 6th the nurse didn’t believe she was as far along as my mom was sure she was, and my mom wanted an epidural but the nurse thought she had loads of time … By the time the anesthesiologist got there it was too late for the epidural and mom still talks about it almost 29 years later … I had the same nurse for one of my deliveries and my mom was like, “That’s the nurse who didn’t believe me!” Yours is such a crazy story Haley! I’m so glad Hildie’s here! Thank you for sharing your story. Your baby is beautiful! I started crying when Daniel suggested the bath. What a wonderful guy he is! I’m so glad you yelled at those nurses! Once things got really moving you took charge. I would would probably be writing letters to people about this. That part also made me cry! 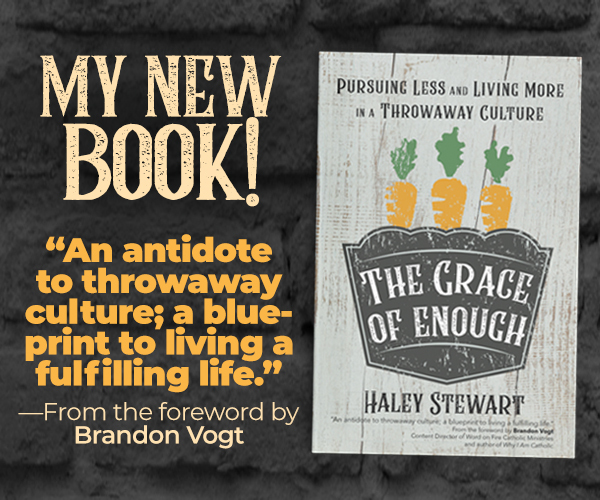 Thank you for sharing this story with us, Haley! What a beautiful, exciting, crazy story! I’m so happy to hear of your sweet baby moon, too! God bless! I had not as dramatic of an experience . I was in the hospital and they monitored me on my back in the morning and told me to go home and said I wasn’t in labor. I walked out of my room with a contraction enough to halt my walking in front of the nurses station and continued contractions all the way to our car. It was summer and our home was across the river with a drawbridge which is up a lot in the summer. So I told my husband to go to a restaurant and have breakfast. The whole time he was getting evil looks from the women around him but I told him to finish and I ignore the women . I was second guessing labor. We went back to the hospital after breakfast and had her within 30 minutes. That is a wild ride and a great story. I am quite convinced my husband has PTSD from our last child’s birth… Induction and a quiet L&D floor on a Saturday and the DR missed the birth?!?!? What the crap!! The nurses’ reactions in Part I made me SO ANGRY. I’m so glad you had the presence of mind to yell at them from the hospital bed. ;o) That really is a fantastic story, though. 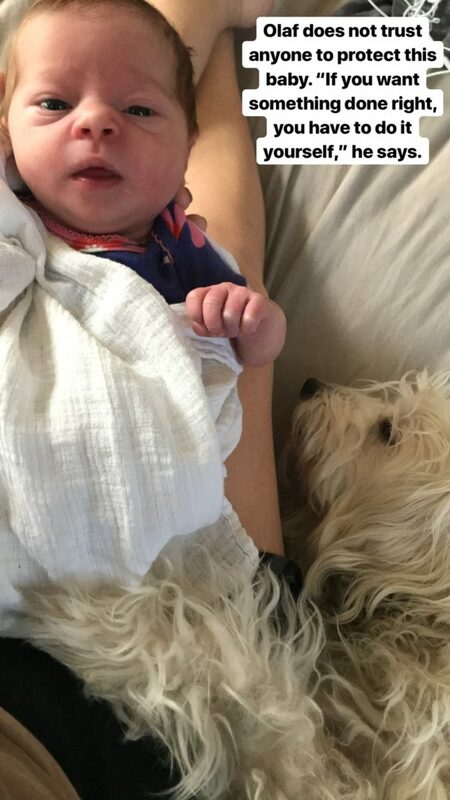 Welcome to the world, sweet Hildie! I understand the anger at the nurses – the day after I delivered my third I started having severe abdominal pain. It was worse than my labor!! The nurse kept telling me after-birth pain gets worse every time (which it does) but I was also throwing up and shaking and hovering in the semi-hypnotic state of extreme pain. She said I was just overtired! Turns out I had an obstructed kidney that ended up requiring surgery. I’ve had to make real efforts to forgive that nurse!!! I have to keep reminding myself that they see so many first time moms that have never felt real pain in their lives. I had a rushing to the hospital labor too (not quite as dramatic!) but it was also my LOUD delivery. 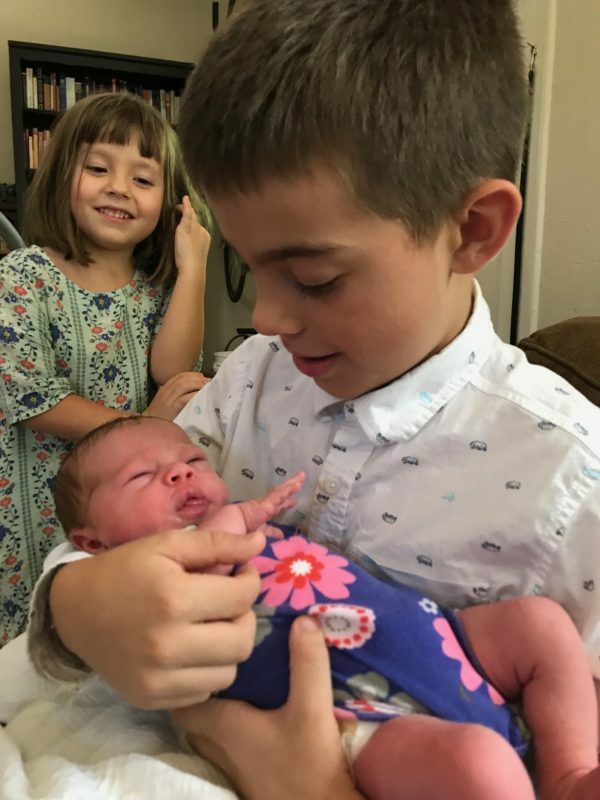 It was my second, and labor progressed sooooo much faster than my first – only four hours from first contraction of the pregnancy to baby-in-arms. Car ride while in transition in morning rush hour traffic, nurse trying valiently then gamely scrapping the iv. I think my screaming was a result of the panic, and the feeling out-of-control, as much as from the pain. I’m sorry your experience had to include panic 🙁 and I’m especially sorry that it included so much self-doubt. That’s the opposite of how childbirth should feel!!! Hopefully the L&D unit learns from their mistake! I wonder if there is something to this! I scream-pushed with my first, had just arrived at the hospital already dilated to 10cm after about 7 hours of labor, transition in the car, etc. it was scary and I did feel out of control! With my second, despite a 2.5 hour labor, I had been at the hospital for an hour already and delivered her perfectly silently in the birth tub. So I’ve been following your pregnancy and didn’t want to share this with you until all was well, but when I had my crazy labor with my 4th (long story ending in emergency c-section) after three wonderful, natural births, the nurses all told me that the labor of the fourth child specifically is often crazy and unique in one way or another. At least that’s what they said they had witnessed at the hospital I was at. They had no real evidence except they had noticed that when moms came in with the 4th something went awry. Who knows how true it is, but it certainly describes your labor and it did mine as well. Yours is truly an incredible story! I laughed out loud at the image of you on that office chair! God bless! Hildie is beautiful! 💕 Praying for your family’s smooth transition. My daughter was en caul as well. The midwife said it’s always neat when they’re born that way. I’m so sorry they put you through that. I would definitely be complaining to the supervisors or directors to ensure it doesn’t happen to anyone else. She’s beautiful and congratulations! This is amazing!! My second was also born en caul and I didn’t get to see it either ☹️ . And I also barely made it to the hospital. Thought not quite as close. I made it and I was at a 10. I had a similar thing with the IV nurse, but my nurse told me to pee in a cup when I arrived (which I’ve never had to do and I still don’t understand why) anyways I went to the toilet and chucked the cup on the floor and said “nope! That’s not happening!” He was born probably 10 minutes later. I’ve been praying for you throughout your pregnancy and I’m so happy for you that it’s over! You are a genius and a warrior who has beautiful babies! Soak up this time and be gentle with yourself. I’m a midwife at a Birth Centre in England. Maybe my perspective is a little devil’s advocate-y? You did an amazing job, you knew your body, you birthed your beautiful baby despite the chaos around you – those ARE important things. Sometimes it is VERY difficult to determine the onset of established labour in a ‘multip’ (one who has had at least 1 birth). Vaginal examinations are notoriously unreliable at predicting the onset and speed of established labour – it’s a snapshot. Unfortunately it can be used as part of the picture and can be used to try and determine what everyone wants to know – when will the baby come? Of course hindsight is 20/20. With that hindsight now, l think l’d have kept you for a few hours to see what happened. But unfortunately that’s easy to say but more difficult in practice when the likelihood is l’ve probably got another handful of women also wanting my care for differing reasons, eg an early labourer who’s struggling, an established labourer, a woman and baby who are wanting me to examine them and get them home, a woman wanting breastfeeding support, women who have phoned and are on their way in from home. I’m not looking for sympathy at all and, having said all that, l do think if you’d been at a more midwifery-led environment (the norm in England), you would have stayed with us for at least a little longer than it appears you did. I’m just trying to give a little midwifery perspective. Also, however, labour may have possibly slowed if you’d stayed. Who knows! I suppose l’ve come round to concluding how unpredictable labour is, especially when it’s not a first labour. But, as l said, you are a warrior! And you deserve all the congratulations possible. What a nice reflection, Sarah! As someone who has birthed at a midwifery-led unit (also in England) I concur with this above statement: These units tend to be more patient (but sadly aren’t available everywhere). And to add: On the flip side of your experience I know the frustration some women have of actually being turned away at hospitals/birthing centers because other women go early-on in labor and just linger for hours and days on end. What I mean is, please everyone remember it’s an extremely tough call to make for the people at the birthing center/hospital to tell a woman to go home, and most times I believe they are right to do so (chiefly because labor always progresses more quickly in a comfortable/non-hospital environment) but obviously not in your case. I do think mothers with prior experience should have more sway, but then again a women I know who just had her sixth baby (all natural) had a two day labor, though at the beginning she was convinced she’d never make it to the hospital…so you never know. Congrats on the new blessing, she’s precious and I’m glad she made it safely, albeit dramatically, into the world. As a fun note: I was told that babies born in their amniotic sac would be safe from drowning, and that in the very old days sailors saved these rare sacs and took them to sea with them to ward off their own drowning….there’s always eBay, Haha. This must be a fourth baby thing! I was also told to not come to hospital, but when I made up my own mind to just go, we barely made it in the door! I’m so angry for you, but I’m equally (and more) happy for your family! Oh mama, congratulations! This is such an amazing story now, but I can imagine how frustrating and frightening it was in the moment. I was sent home at 2cm as well, after being told I was a first time mother and didn’t understand my body. I drove myself back to the hospitsl 45 minutes later because I could feel her crowning. I was angry about it for a long time. It’s 100% okay to just let yourself feel all those emotions! (But mostly the emotions that keep your huffing that sweet baby head and snuggling close.) Sending all my love. This is such an amazing story, Haley! I can just imagine you wheeling down the hall in your office chair!!! I love that Daniel was such a support to you, even when the nurses were not. (What were they thinking? You’d expect experienced L&D nurses to know that things can change drastically in a few minutes, especially the fourth time around!) Your dear little Hildie is beautiful! Enjoy your babymoon! Oh my gosh, she looks like a model!!! I think God she and everyone are well. You didn’t blog for days so I figured she’d come and I was just praying everything went okay. I’m sorry you don’t have any video lol or a picture of her in her waters, but she’s still going to have so much fun telling the story when she’s older!! What a crazy story!!! I THANK GOD for the LD nurses who helped me advocate for myself. #3 and #4 were both born less than 15 minutes after I checked in. I labored in the parking lot for quite awhile with #4 because I was so afraid of being sent away after weeks of prodromal labor. It is no joke! Oh, girl. I feel you! I was also sent home with my 4th, contractions had slowed down on the monitor, of course. I know very well that feeling of self-doubt and uncertainty. We did end up back at the hospital several hours later, and while it wasn’t quite what you went through, we did cut it closer than I wanted because I couldn’t bear the thought of being sent home again. So glad she is here and you are all doing well! They spent an hour trying to get an IV in me while I was in transition….AND taking my blood pressure DURING contractions. I feel you. Congratulations!!!! My sister’s second baby was born en caul too!! It’s truly amazing. This whole story sounds oddly familiar! I was sent home while in labor with my third baby last August. I was also told I wasnt in labor and to take a benadryl (and was offered ambien) to sleep. I labored in the tub at home and had to race to the hospital less than two and a half hours later…only to deliver in the labor and delivery lobby! Well done Haley on a tricky pregnancy and v.exciting delivery. Warm congrats.I know that feeling about just being so glad to not be pregnant anymore! My daughter who is now 18 months was born en caul. I didn’t see much of it due to my slow enjoyment of the “Oh thank the Lord she’s finally out!” moment but my friend took photos and they are a little alien-like and beautiful at the same time! It’s interesting to see how many folk give anecdotes about en caul births. After my experience, I’ve since come to doubt the statistics touted on the internet as to it’s rarity. I mean it’s rare but I don’t think it’s quite as rare as suggested by some sources. Or maybe the 1 in 80,000 is when they are born completely en caul with no rips whatsoever? My daughters sac tore a little as she came out so although we have photos of her squirming in her sac I think that’s technically a ‘caul birth’ rather then an ‘en caul’ birth. But hey, I’m calling it en caul because the translation fits. Plus, it hurt lots so I’m claiming ALL the points!! Wow! So relieved that baby is here and that everyone is safe and healthy. I must admit that reading through the comments has been cathartic for me. My entire labor, start to finish, with my 2nd was only 80 minutes. I got to the hospital parking lot at 5:45 am. By the time I got wheeled up to labor and delivery, it was after 6 am. The nurses were trying to get me to leave a urine sample in a cup and asking me about when I last ate, etc. They also wanted to try to insert an IV. I remember stripping off my clothes and hurling myself onto the hospital bed. Lucas was born about 10 minutes later! No monitor, no IV, no gown on me. He just was ready! Out he came! One of the nurses caught him. I told them he was coming out… I was right. It took me being pregnant with 2 more kiddos to realize what an impact that birth had on me. Everyone laughed and said “oh he was just in a hurry,” or some other silly comment. It took me a long time to realize that it was a traumatic birth. Yes, baby was healthy. I was healthy. But the experience itself was traumatic. Remember that and give yourself time to process all that happened. 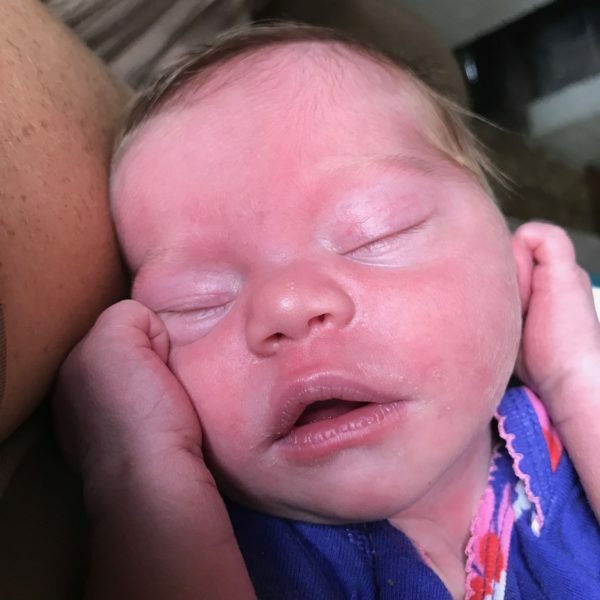 What an incredible birth story!! Thanks for sharing. I too prayed Hail Marys throughout my contractions (I remember needing to say it twice to get through) and it was such a comfort and blessing. God bless your family and little Hildie! Congratulations!!! So happy for your beautiful family!! Our fourth was born two weeks ago (a boy, after three girls), and my birth experience involved the midwife apparently not understanding my husband when he told her the baby would come fast. All of a sudden the baby’s head was halfway out and, after maintaining complete control through my entire labor, I was screaming “Help me! !” while the nurse yelled at me not to push in between hollering for the midwife to get back in the room. Oy. I hope you are able to mentally process your birth experience and come to a place of peace and healing. <3. 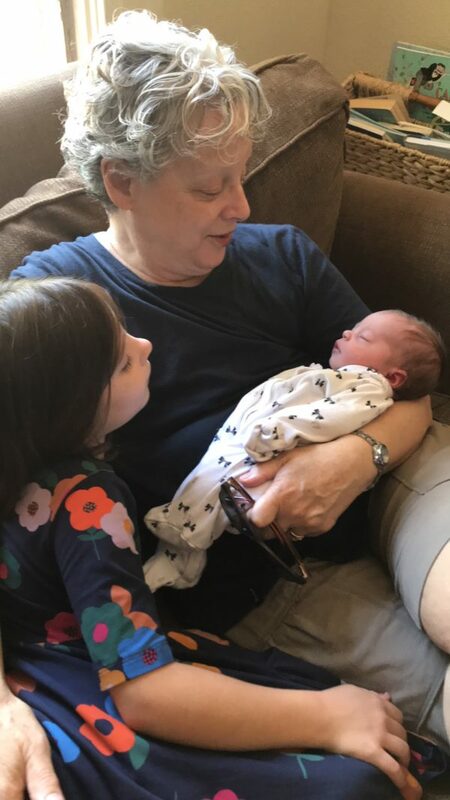 Mazel tov, and welcome to baby Hildie! Oh my goodness, she is precious. Those nurses who sent you home were stupid, and I’m a nurse, so I know stupid nurses. 😂 I have a 4 month old, my sixth baby, and she was much like this. I was 2 cm, and then she was coming. Nurses delivered her, dr was in the stairwell, lol. Seriously, that image of you in the office chair, yikes! Wow! I am so glad Hildie arrived safely and you survived. This is one story for the books! When I went to the hospital to deliver my 2nd son (strong contractions, we lived quite a ways away in the cuntry and had left our 2 year old son at home wuth a sweet neighbor); they sent me home bc “I was in too good of a mood ; i.e., I was still able to smile.) We trekked back home ( 2 a.m.) just to turn around an hour later and deliver without my dr., without any pain relief, etc. But we got our secobd beautiful son, Joel Louis. Sadly, he passed away last year in an accident. I treasure every second I remember of his joy-filled, and joy-giving life. May God Bless you all! This happened to me! My 4th baby was born on the hospital hallway floor while we were living in a school bus! Totally crazy experience! Amazing!!! I CANNOT believe they sent you home. I also had dumb prodormal labour for about two weeks before our last (also 4th) was born. When we finally went to the hospital I was barely anything and contractions were all over the place but the nurse DIDNT want to send me home because it was my 4th and “things can go quickly” so we walked and had supper and things definitely went quickly. I’m so glad Hildie is here safely and that HG is over for you and you can hold her in your arms. Bless your family! Congratulations on your beautiful baby girl! My youngest daughter’s middle name is Rose too (after my great grandmother). I’m sorry that you went through such an ordeal! 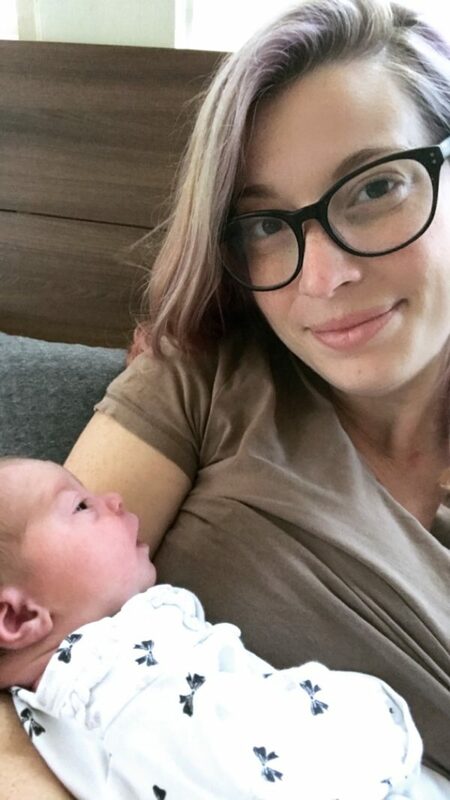 I switched from hospital births to home births after an unplanned home birth with our second, and I absolutely love it! It is the exact opposite of the nightmare you dealt with. If nurses did that to me and I was sure I was in labor, I would just stay in the lobby or waiting area–they can’t actually force you to leave the building. Just something to consider if it happens again. As a labor and delivery nurse who loves and supports natural labor I’m a little sad by all the hateful words towards nurses in these comments. As 2 midwives posted it is exceptionally hard to know exactly what is going to happen during labor. it is unpredictable. Haley I’m so sorry you doubted your body and yourself we never want that. As someone with a history of long labors and presenting with no cervical change they didn’t expect you to deliver so quickly. Some providers do allow patients who are having those absolute feelings of labor stay and get rechecked again. But to be a devils advocate there are many people who do insist they are in labor, they are sent home, and we don’t see them for weeks to have their baby. It is a hard balance of keeping the patients who need to stay and ensuring there is room when someone comes in pushing out a baby. A lot of times women come in, they stay because they hurt, and then end up needing pitocin and having long labors. As for the iv, that could have waited until after delivery, but with a history of anemia and needing pitocin for bleeding reasons, they had good reason for wanting an iv in the case of a hemorrhage. Haley once again I’m really sorry you had a traumatic birth. Many prayers for a full recovery emotionally and physically and congratulations on your new beautiful baby girl. I actually have a history of precipitous labors and explained that to the nurse. In fact, I went into great detail that my cervical change during my 2nd and 3rd labors did not match up with how far I was into labor and that in both cases I jumped from 5-6 centimeters to 10cm and was pushing in a matter of seconds. My concerns were dismissed. I’m so very sorry you had a traumatic birth. Prayers for a full recovery. As someone whose son was stillborn because the Dr sent me home- no. Do we recognise that doctors and nurses are human and fallible? Yes. Does that mean they get carte blanche to ignore our concerns when we are at our most vulnerable? No. On the contrary, if medical staff would only admit their own fallibility, they might be less deaf to the cries of their patients. And until you have experienced a traumatic birth, you cannot imagine the sense of betrayal experienced by a woman who has been treated like a “dumb blonde” for expressing the truth of her non-standard pregnancy, and then had to deal with the results of the dr/nurse’s arrogance. I told the Dr I felt no movement at 35 weeks. I insisted. He found a muffled heartbeat of 133on the doppler and said I was just an overanxious mother (in spite of the fact that my previous birth had ended in infant death at 36 days.). The next day the ultrasound showed no heartbeat. I was induced to deliver a baby whom the autopsy showed to have been a healthy baby strangled by the cord. If the Dr had listened to me and at least done an ultrasound, at 35 weeks my son could have been delivered with an emergency c-section, and be alive today. I recognize that most medical personnel have good intentions, but do not belittle the betrayal a woman experiences when her justifiable concerns are ignored, and she is left to deal with fallout. Noel, I am sorry for your loss. No words can make that right to you. I in no way intended my words to be belittling or to say that medical professionals are infallible or that the concerns of mothers are unwarranted. It seems my response was poorly written as far as conveying my true feelings. I do understand that medical professionals are fallible and wrong, as are all humans. I also believe that every concern of a mother should be addressed and followed through with. The original intent of my post was to explain why Haley might have been sent home, and yes, to say that there is something wrong with the system. I apologize if I have caused you further harm or pain, as that was and is never my intent. All the more reason that they should LISTEN TO MAMAS. We know things. Medical science knows practically nothing about pregnancy and birth and the vast majority of hospital procedures for birth have zero evidence backing them up. Medical staff need to know that and listen to laboring mamas. And when they don’t and they cause trauma like this, we have every right to be angry and demand change! It won’t get better otherwise. I am so sorry that they sent you home, but I’m happy to hear that it all worked out. My grandmother was born in her bag of waters and her Irish parents thought it was a sign of help and love from our lady. They dedicated the baby to her and dressed her in only blue and white for the first two years of her life. Because of this, my Nana had a very strong devotion to our lady throughout her life. I think I was holding my breath and then on the verge of tears for you reading this! Oh how stressful! I’m so thankful that the two of you were okay and that your healthy and that she’s thriving! She’s beautiful! I’m sorry you had to go through all this! But what a story you have to tell. I’m still just shaking my head. You really would think they’d believe you… it’s like it’s your first rodeo! Wow! I can so see you in her! Congratulations and many blessings! What an amazing birth story and beautiful ending (and beginning)! Congratulations to you all! What fun memories you are making! This is the glue that will strengthen your marriage and your family 🙂 Thanks for sharing your story! Congrats! I was sent away from the hospital with my second, they wouldn’t admit me despite the fact that I knew I was close. We came rushing back an hour later but I didn’t make it into the hospital, my baby came so fast that I ended up delivering him myself in the hospital parking lot while my husband had run towards the building to get help. Everyone was fine, I have a very healthy boy and a unique birth story, but I will never forget that feeling from the delivery, a mix of numb terror and maternal instinct. I wish my birthing classes had covered the basics on emergency deliveries. I suggest everyone be more prepared for that possibility than I was, it is more common than you think! 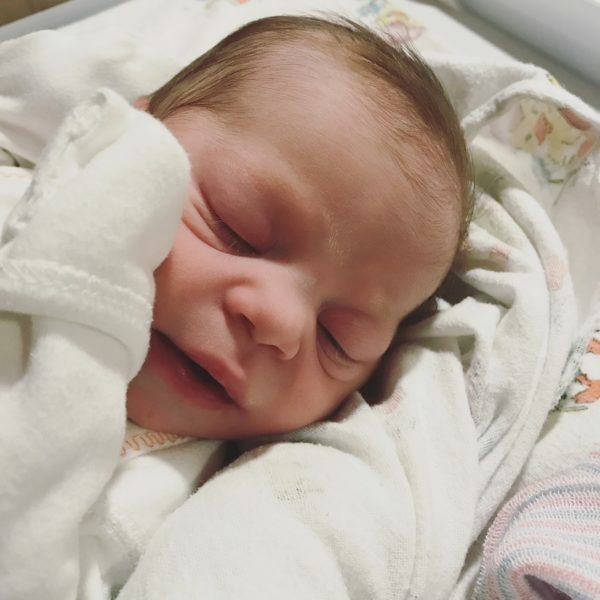 Congratulations that is one good birth story! I appreciate your honesty throughout the story about your emotions. It makes me feel like I’m not alone in the despairing, feeling embarrassed about “false alarms,” and loss of confidence at various points in the last few weeks. Prodromal Labor is the absolute worst. Welcome Hildie! I love this. No joke it being terrible to live through but a great story. He’s to more snuggly goodness! I’ve always had at least one capital “B” nurse (my husband’s kindly terms) at delivery. I feel for you, but what a great story! Congratulations! I’m so happy for you that you’re not pregnant anymore (that feeling is so good after 9+ months!) and have that beautiful new addition! Oh my goodness! What an adventure! I’m so glad it’s over for you and you have that sweet baby in your arms! So we went. Had contractions all the way. STILL DID NOT THINK IT WAS TIME. Ignorance is bliss is real, my friends. Walked in. They check me. NINE CM dilated. Had a baby within 30 mins. Her birth through me for a loop! But my previous birth had been all kinds of emotional roller coasting, so the full and complete denial that I had about being in labor with my second ended up being such a gift. God works in amusing ways! !